In the Boston area, A-1 Lighting installs, maintains, and repairs exterior and interior lighting systems for industrial, residential, and insitutional properties. Boston trusts A-1 lighting service for interior and exterior lighting installation and management. 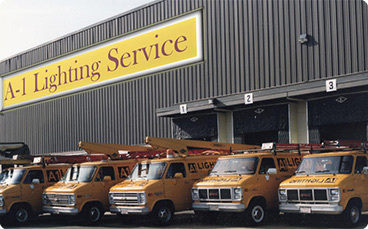 Serving Boston, MA and surrounding areas, A-1 Lighting Service Company installs, repairs and maintains interior and exterior lighting systems for commercial, industrial and institutional applications. Our clients have included retail stores, colleges, the banking industry, property management companies and commercial manufacturing plants. Since 1965 we have been committed to providing excellence in service. When you hire A-1 Lighting Service for your lighting and electrical needs you get a job done by our trained staff of professional electricians and technicians.